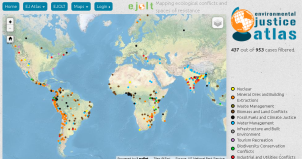 In the EJOLT Atlas, www.ejatlas.org, which is such a success, we can trace whether indigenous populations are involved or not in the one thousand conflicts we have collected so far. We have two questions on this issue in the Database Form. One asks whether Ethnically Discriminated populations are implicated, the other asks whether Indigenous or Traditional Communities are implicated. The two questions are in an open list together with other, they are not mutually exclusive. The second question would include not only indigenous communities but also traditional communities of peasants, fishermen, artisanal miners… who belong to the mainstream nationality in the country or region. Filtering by these two questions, results have been published already for Colombia by Mario A Perez showing that indigenous (pre-Hispanic origin) and Afo-Colombian communities (to simplify, resguardos and palenques) are disproportionately affected by environmental injustices resulting in open conflicts. In an article in El Espectador (a top Colombian newspaper) Carlos Andrés Baquero uses again such data to show the incidence of environmental conflicts on indigenous and Afro-Colombian minorities. Of the 72 cases of conflict that were already uploaded a few weeks ago, in 42 there is involvement of such ethnic minorities, a proportion much higher than in the population as a whole. Another point is that indigenous communities are hit twice as often as Afro-Colombian communities. Such findings directly link back to the original interpretation of environmental justice in the civil rights movements of the United States in the 1980s (by Benjamin Chavis, Robert Bullard and other activist-authors) as a fight against “environmental racism”. A map prepared by Mario A Perez showing the geography of environmental racism in Colombia is included in the article in El Espectador. Of course, indigenous and Afro-Colombian peoples live often at the frontiers of commodity extraction. We guess the trend will be confirmed for Brazil (regarding both indigenous and Afro-Brazilian populations), and for indigenous populations in many other countries in Latin America. We wonder whether the data for India will allow analysts of the EJOLT Atlas to do a similar analysis in terms of caste/tribal identities, and what the results would be for Africa. Such hypotheses and findings should be of immediate interest to international bodies, in particular to the UN rapporteurs for indigenous rights and for human rights. We ask ourselves how long it will take for UNEP to start work based on EJOLT and other sources on resource extraction and waste disposal conflicts in the world today. UNEP keeps rather silent on the thousands of socio-environmental conflicts and their many victims. In El Espectador’s article there is however a misinterpretation of the EJOLT data when it points out (once again) that Colombia is the second country in the world (after India) in the number of conflicts. This is true at present in the EJOLT map, the reason being that we are still behind in the compilation of cases for Mexico and Brazil in Latin America, and for Indonesia, China and other large countries in other regions.